HIGH SEAS NUI Galway’s 38-ft racing yacht, which the team chartered especially for the Round Ireland race. American author George William Curtis once said, ‘It is not the ship so much as the skillful sailing that assures the prosperous voyage’. This is something Westport native Joan Mulloy can attest to. 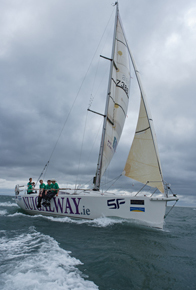 The Civil Engineering graduate and member of Mayo Sailing Club was on the NUI Galway sailing team that finished first in their class and sixth overall in The Round Ireland Yacht Race earlier this summer. Joan was one of three Mayo sailors – the others were her brother, Louis Mulloy, and fellow Civil Engineering graduate David Fitzgerald – in the ten-member NUI Galway crew that circumnavigated 1,400km of Ireland by sea. Thirty seven boats from Ireland, the UK and Europe entered this prestigious race, which started on June 24 last. Joan and the crew – one of the youngest teams to ever compete in the event – sailed past the finish line in their chartered Reflex 38 racing yacht in five days, two hours and seven minutes. And out of those five days, Joan says, the first night was the most memorable. With equal tones of passion and modesty. Joan simply says they had ‘a good run’ and acknowledges that the constant trimming of sails gave them ‘a bit of an edge’. As one can imagine, living in confined spaces on a yacht with nine other sailors can be testing, but is it more difficult when one of the crew is your sibling? “No, it was fine. We were on opposite watches.” Joan was quick to note that this was not on purpose, explaining that herself and her brother ‘work well together’. Having sailed alongside Louis in Rosmoney, Westport, previously, it should come as no surprise that the two make a great team. They succumbed to ‘the sailing bug’ from an early age. According to the NUIG crew ‘trimmer’, the secret to the crew’s success was ‘discussing it’. Describing the worst moment of the circumnavigation, Joan paints an edge-of-your-seat picture involving the dying hours of one of Europe’s top offshore races, a dwindling lead due to significantly depleting winds at the north tip of the country, and a broken sail. With the crew being mentally and physically drained, Joan explains that they were ‘so tired they didn’t have time to be upset’. In a fairytale ending the crew managed to fix the sail in an impressive ten minutes and went on to finish first in their class and sixth overall. Describing her sailing experience to date as being ‘quite lucky’, with no significant accidents or mishaps, Joan singles out the Round Ireland experience as her favourite sailing route in the world. Having wanted to complete the Round Ireland trip for a long time, Joan now admits that she sees Ireland in ‘such a different way’. Coming short in her attempts to describe the feeling of sailing, Joan warmly suggests that ‘it’s something you just have to experience’. Admitting that competitively she doesn’t get to fully appreciate it as she is mainly focused on ‘making the boat go faster’, it is obvious that this long-standing pastime truly puts the wind in this engineering graduate’s sails. Mayo Sailing Club has over 250 members, with 33 cruiser/racers, five adult dinghies and 25 junior dinghies all taking part in activities during the season. For more information on the club, visit www.mayosailingclub.ie.